Inventory We are a resale marketplace, not a box office or venue. Ticket prices may exceed face value. This site is not owned by Pepsi Center . The Pepsi Center in Denver is home to the Colorado Avalanche of the National Hockey League and the Denver Nuggets of the National Basketball Association. The Pepsi Center Box Office opened October 1, 1999 with a Celine Dion concert at a total construction cost of $160 million. 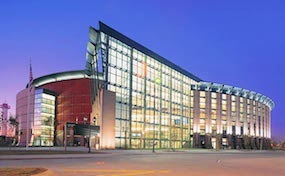 The Pepsi Center is located on 1000 Chopper Circle in Denver, Colorado. Many huge events have offered Pepsi Center Tickets such as the NHL All-Star Game, Stanley Cup Finals, NBA All-Star Game, the Frozen Four Tournament, NCAA Tournament, and more. The Pepsi.CenterDenver.com is a privately held company that specializes in the sale of tickets in the secondary market. We are not affiliated with any official supplier or box office. To purchase tickets to any Pepsi Center in Denver events simply call our operators at anytime or click on the event you wish to attend.